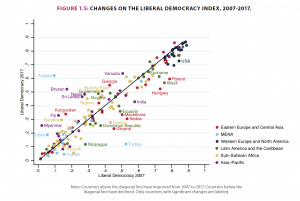 While the global level of democracy has not changed dramatically from last year and remains close to its all-time high, the 2018 Varieties of Democracy (V-Dem) report covering 178 countries published this month has found that democratic backsliding is accelerating. “We are less optimistic than we were a year ago” V-Dem scholars wrote in the Washington Post. The “state-led debilitation or elimination of the political institutions sustaining an existing democracy” is now occurring in nations whose combined population accounts for one third of the global population or 2.5 billion people. This process of autocratization entails reductions in the checks on executive power, repression of press freedoms, and limitations on freedom of expression. Much of this trend is accounted for by democratic backsliding in four of the ten most populous nations: India, Russia, Brazil and the USA. 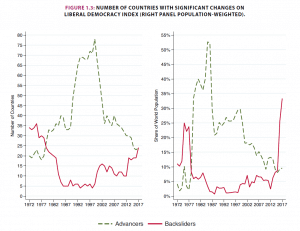 According to the report, for the first time since 1979, the number of countries backsliding on democracy – 24 – is the same as the number of countries advancing. 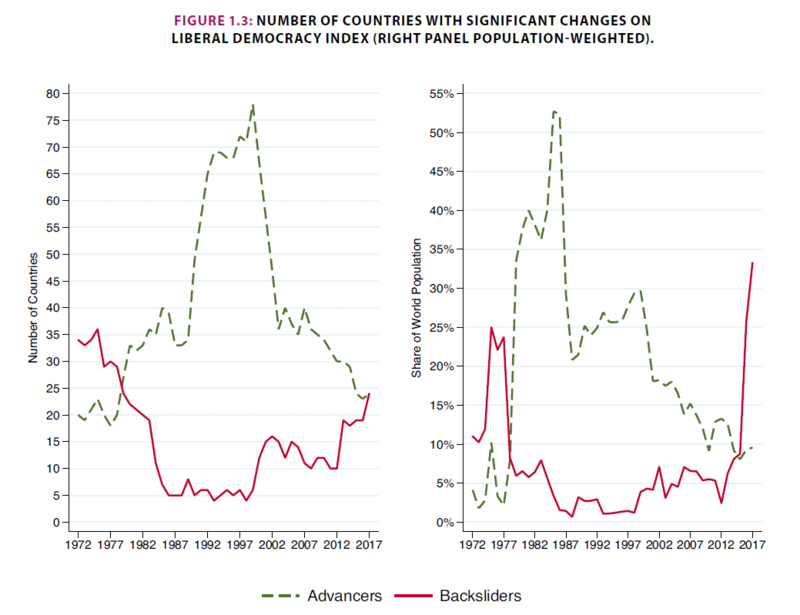 Notably, while a greater share of the population lives in increasingly autocratic states, the actual number of governments backsliding has not increased considerably. Inequity rose in this period, with socio-economic exclusion rising for many sections of society. 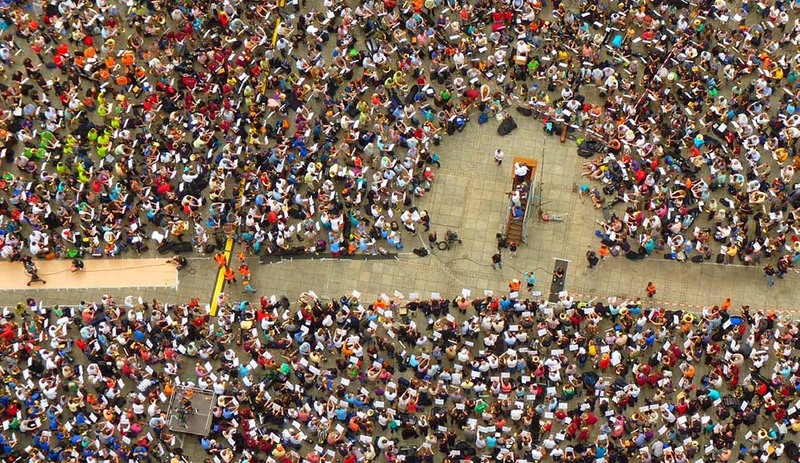 Over a quarter of the global population is now affected by intensified political exclusion. This has manifested particularly heavily in 14 countries, with the worst being Burundi, Mauritania, Iraq, Yemen, and Panama. Only 15% of the global population lives in societies with equitable distribution of political power in gender terms. In contrast to other world regions, Sub-Saharan Africa has on average seen improvements in the quality of democratic institutions. Similarly, more nations attained genuine multiparty elections than lost them, and the proportion of officials subject to elections has also increased. Overall, a greater share of the world population still lives under democracies than autocracies. 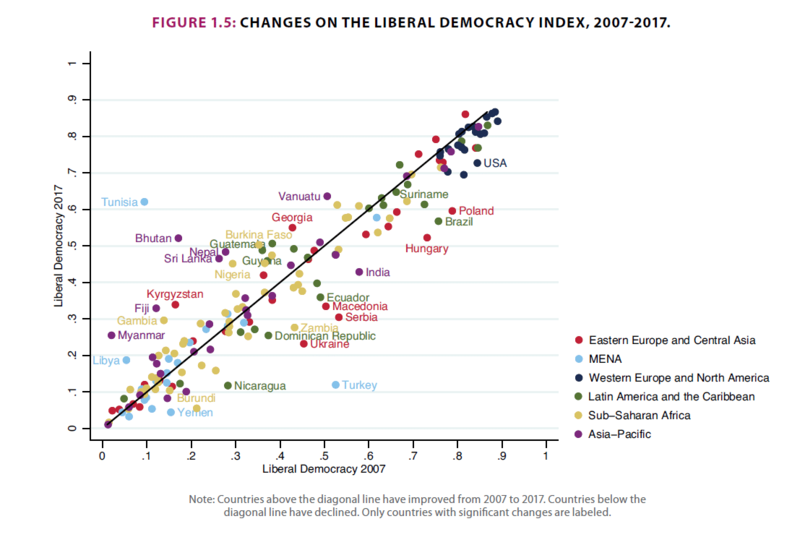 The report highlights that the USA and India have seen precipitous declines in many aspects of liberal democracy. The 2016 US election was ranked only “somewhat” free and fair, a decline from “fully” free and fair elections prior to 2016. Meanwhile, measures such as “executive respect for the constitution” and “compliance with judiciary” have dropped precipitously since 2016. The democratic institutions of the United States remain robust, but liberal aspects of democracy have been weakened. At the same time India, the world’s most populous democracy, has seen a decline in the freedom of expression, through issues such as media self-censorship and harassment. New laws have reduced active civil society organisations operating in India by around 60% in 2017 alone. V-Dem are a think tank, who produce holistic datasets that seek to analyse the concept of democracy as a system of rules that go beyond the simple presence of elections. The report’s methodology has five experts assess each country on measures of liberal democracy, which are divided into a range of indicators. These analyses are then synthesised with a dataset “based on factual information obtainable from official documents such as constitutions and government records”.